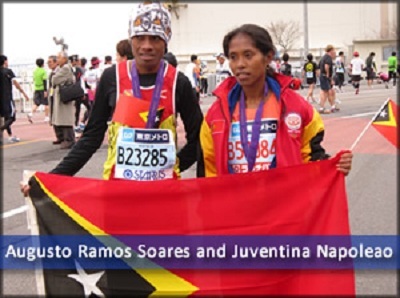 Meet Augusto Ramos Soares and Juventina Napoleao, two proud competitors representing the small Southeast Asian nation of Timor-Leste. When I visited Timor-Leste more than a decade ago as a congressional staffer, the people there were still struggling to achieve peace and independence, much less a day when their nation would be able to send its citizens to the world stage. Yet, in a matter of hours, Olympic dreams will come true, not just for Soares and Napoleao, but for all their countrymen. This feat might not have been realized without the dedication of United Nations peacekeepers. It was a UN Peacekeeping mission that helped turn the dream of independence into a reality in 2002. And when violence erupted again four years later, peacekeepers helped restore stability, ensuring that the young nation could move toward a better, more prosperous future. Today, UN peacekeepers continue to support Timor-Leste by bolstering the police force, training and recruiting officers, and promoting democracy. In fact, in the recent democratic elections, peacekeepers provided extensive technical and logistical support. But last year when South Sudan declared its independence—an outcome that would have been unthinkable without the profound assistance of the UN peacekeeping mission—running took on new meaning for Marial. Although South Sudan has yet to form an Olympic committee, its journey to becoming a sovereign nation has enabled Marial to participate in this year’s Olympics as an independent athlete, competing in honor of his new nation. The London games will be the first Olympics for Napoleao and Marial and the second for Soares, who returns after competing in Beijing in 2008. Yet they each share one thing in common: The honors they bring to their countries are reflective of a hard-earned peace, and the dedication of UN peacekeepers. As Opening Ceremonies begin, let’s thank those UN peacekeepers who promote peace and stability—not just in Timor-Leste and South Sudan, but in 17 missions around the world. They enable a new generation of youth, like these three phoenixes, to dream and achieve.